Microsoft has announced that it will be dropping online support for all original Xbox consoles and games, including those that are played on the Xbox 360. It's probably long overdue but that doesn't mean that a whole lot of Xbox owners aren't going to be seriously unhappy with this decision, as evidenced by many of the responses to the announcement on Major Nelson. Fans of Halo 2 and Star Wars: Battlefront appear to be the most grievously wounded, although a few other games are mentioned as well, but Microsoft's Larry Hryb says it's necessary in order to facilitate the future development of Xbox Live. "I wanted to let you know that on April 15, 2010 Microsoft will discontinue Xbox Live service for original Xbox consoles and games, including Xbox 1 games playable on Xbox 360. Our first step in this process will be to turn off auto-renewals for those members who only use Xbox Live on a v1 Xbox," he wrote. "While I can't comment on the specifics, this change will allow us to continue evolving the Live service with new features and experiences that fully harness the power of Xbox 360 and the Xbox Live community. We did not make this decision lightly, but after careful consideration and review we realize that this decision will allow us unprecedented flexibility for future features." Xbox Live General Manager Marc Whitten offered a few more details about the impending shutdown on the Gamerscoreblog. 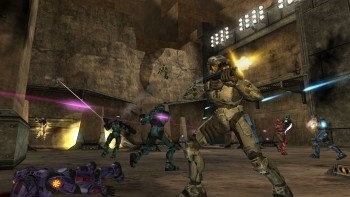 "There's no greater example of the power of the Xbox Live community than the Halo franchise. Halo 2 has had an amazing run on Live, with a dedicated community more than five years after launch and well into the next generation of consoles. It has fundamentally changed the way we play video games. And while it's difficult to see that run come to an end, the Halo franchise continues to act as the benchmark for multiplayer gaming in this generation, with Halo 3, Halo 3: ODST and soon Halo: Reach on Xbox 360." "Your Xbox Live community has grown to 23 million strong. And as we look down the road, we'll continue to evolve the service with features and experiences that harness the full power of Xbox 360. To reach our aspiration, we need to make changes to the service that are incompatible with our original Xbox v1 games," he continued. "We'll share more details soon, but in the meantime I want to assure you that the best is yet to come for Xbox Live." As a PC gamer, my perspective is admittedly skewed, so I'll ask you, dear readers, instead: Aside from Halo 2, which should hardly be an issue because, as Whitten noted, there's plenty more where that came from, does anyone really care?